Madinat Jumeirah’s Fort Island expansion ... set for completion in October. Madinat Jumeirah, a five-star hotel in Dubai, will offer the largest hotel event space in the country when the Fort Island expansion is completed next month (October), said Jumeirah Group, owner and operator of the property. Spread over 1,750 sq m, the space has tripled in size and is set to host banquets, parties, exhibitions, product launches, music concerts, weddings, sports events and festivals for up to 1,400 people. The capacities at Fort Island have increased from 425 people to 1,400 people in a cocktail set-up and from 250 people to 1,100 people in a banquet style set-up in rounds of 10. Located in the heart of the resort and surrounded by Madinat Jumeirah’s characteristic waterways, the venue will feature an attractive and sustainable landscape, while preserving the fort’s traditional look and feel. Fort Island will be connected to the resort by four bridges and guests can also access the venue by the traditional wooden abra boats when staying in one of Madinat Jumeirah’s three hotels. 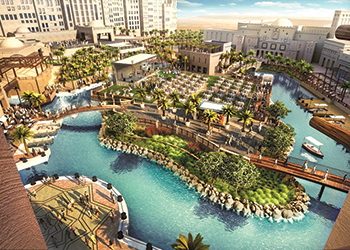 An integral part of the existing Madinat Jumeirah’s conference centre, the new island will increase the centre’s overall capacity to 9,000 people over 10,000 sq m.
The conference centre is home to international events such as Dubai International Film Festival (DIFF), the World Economic Forum and is the proud sponsor of Art Dubai. Madinat Jumeirah offers a variety of multipurpose indoor and outdoor spaces throughout the resort. These range from meeting rooms, banquet and events facilities to more than 40 restaurants, all accessible from the resort’s three hotels. Fort Island was built in 2003 and has since been a unique stage for a significant number of conferences, events and a range of high-profile occasions.